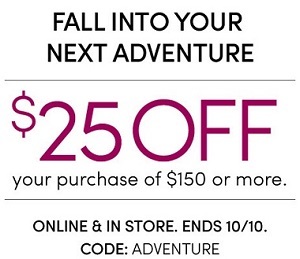 Visit any U.S. Athleta store location or official website and take $25 off purchase of $150. To receive the offer use the promo code ADVENTURE. Source of the information is Athleta. The offer expires today (10/10/2016). For more details see any Athleta store location in the U.S. or Athleta online.